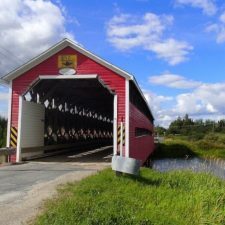 Abitibi-Témiscamingue is still home to fourteen covered bridges. These structures proved very useful in the years of settlement. The purpose of covering the bridges was to protect the structure from bad weather. 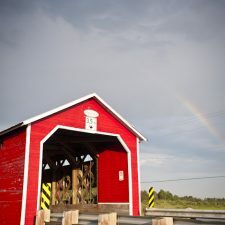 In addition to being called “settlement bridges”, covered bridges were also referred to as “kissing bridges”. Legends were often associated to them. 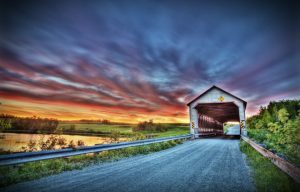 Covered bridges were a place where villages held public meetings and auctions and were used as notice boards; they also kept young people in love shielded from curious gazes. Explore our back country and discover many architectural gems. Built in 1941, this bridge spans the Vassan River. It is called after one of the first pioneers of the area, Hervé Champagne. Key characteristics of this structure include unusual side openings, a nonstandard deck width (5.38 m), a 4.72-m vertical clearance, arched porticos and corbelled drips. 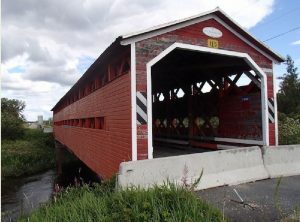 This bridge, built in 1950, is located on chemin Lavoie Ouest. 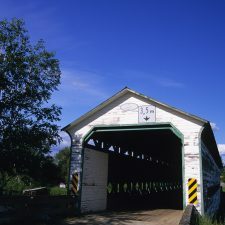 Spanning Davy River, it is one of Quebec’s most recent covered bridges. The beams are jointed together by four nails rather than the usual set of five. 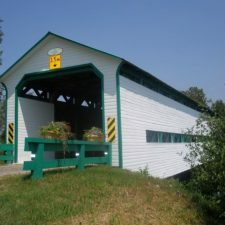 Built in 1942, this covered bridge is situated in Rochebaucourt. The name refers to the frequent presence of moose in the area. Originally the bridge had arched porticos, but the structure was modified in 2002 due to damages caused by flood waters. Built in 1937, this bridge crosses Tourville Creek (RR 5 and 6). Its name (French for Noah’s Arch) refers to the fact that it was carried away on several occasions by spring flood. 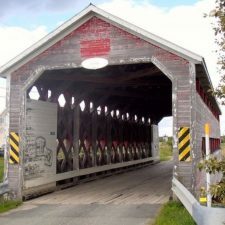 One characteristic feature of this bridge is the gentle pitch of the roof. 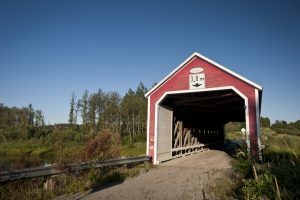 Built in en 1954, le pont des Chutes, 63.7 m long, is the second largest covered bridge in Abitibi. Spanning the Laflamme River, the bridge has beautiful arched porticos, which is increasingly rare. This bridge was built in 1930 on the road between RR 2 and 3; it spans the LoÏs River, which was originally named “Molesworth”. In the early 1950s, a central pillar was added to the bridge in order to increase its load-bearing capacity. The side openings were modified; they now have an arrowhead shape. 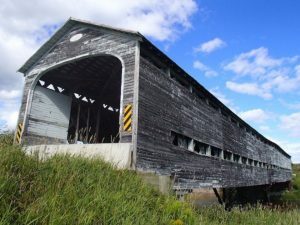 Built in 1927, this bridge runs across the Bouchard River. It is named after a pioneer family of La Sarre. 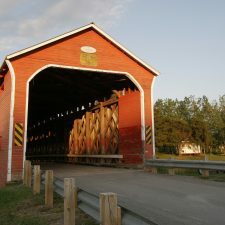 Its main characteristic – other than the fact that it is one of the oldest covered bridges in the region – is the addition of the ornamental elements to the side openings. This bridge, built in 1927, is situated on the road skirting RR 8 in La Sarre. In the early XXth century, an engineer working on the construction of the transcontinental railroad christened Des Méloizes River “Calamity” because of the many obstacles encountered when travelling upstream. It is one of the oldest bridges in the region. 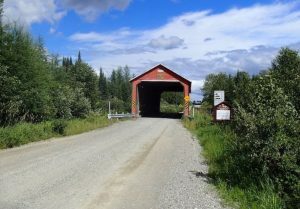 This bridge is situated on the road between RR 8 and 9 in Authier-Nord. It was built in 1928 and spans the Macamic River. It was named after the Levasseur family, who lived close by. Its main characteristics are a steep-pitch roof (35 degrees +) and arrowhead-shaped side openings. Built in 1950, this bridge spans the Des Méloizes River. Over the years, it was painted in many different colors, but has been red since the 80s. 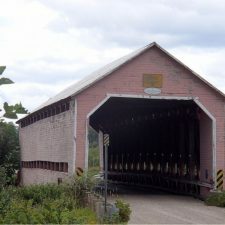 As opposed to other covered bridges, this one has one row of windows; there are no other bridges in the region with this type of side openings. 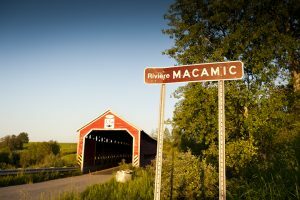 The only covered bridge in Quebec that links an island to the mainland is located on Nepawa Island. This bridge runs across Lake Abitibi. Construction of the bridge started in 1945 and ended in 1946. The first families living on Nepawa Island originated from Îles-de-la-Madeleine. This bridge is located in an area with a high archaeological potential; artifacts were found in close proximity. Named in memory of a pioneer, Albert Dénommée, this bridge was built in 1933, and was extended 10 m in 1950. The ornamental elements skirting the roof are one of its particular features. Other characteristics include corbelled drips and a low-pitched roof (up to 25 degrees); this is not frequently seen in the region. 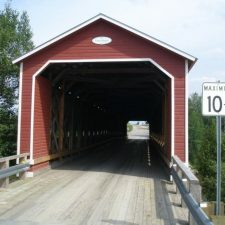 This bridge, built in 1932 and named in memory of two Landry families, was restored in the spring of 2000 for the municipality’s 100th anniversary. Steel jigs were secured to the corbelled drips. While this bridge is fairly old, it has undergone little change over the years. Initially dark in color, it has been white since the 70s. Évaluation patrimoniale des ponts couverts en Abitibi-Témiscamingue et au Nord-Du Québec, ministère des Transports du Québec, February 2009.